Student workbook to support students throughout their Cambridge IGCSE Geography course, with plenty of extra practice questions and activities. 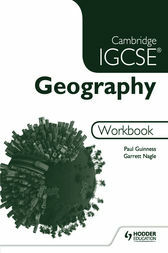 Accompanies the Cambridge IGCSE Geography student text book, following the contents and chapter order. Studetns wirte their answers in the book and keep it for study in class or at home throughout their course.